My friend Luke joined me for Sunday’s game. His government name is Luke but he’s been called Ozzy since he was 15. He doesn’t mumble as much as he did in his younger days, but that was the reason for the nickname. 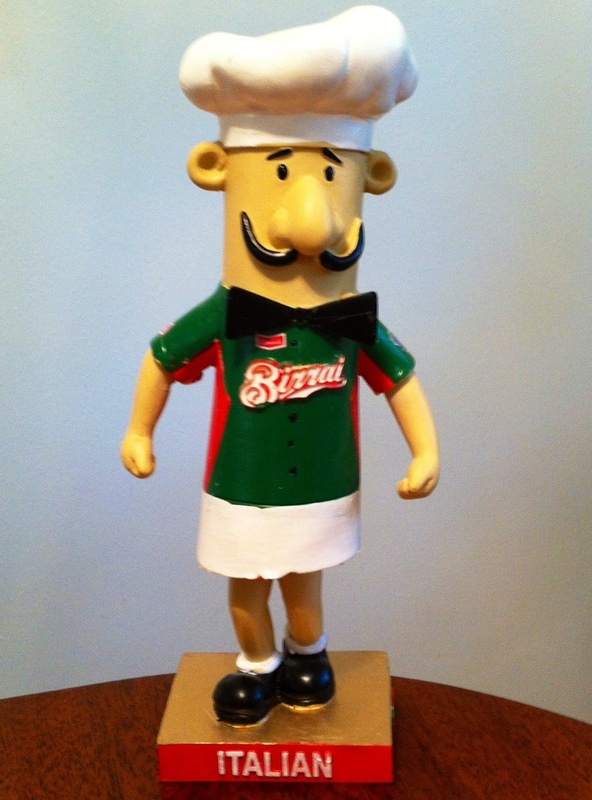 Sunday was Italian Heritage Day at Miller Park, and it was also Italian sausage bobble head day. His shirt says Birrai, which is Italian for Brewers. Ozzy met me at my parent’s house, and we left at 11:00 am for the 1:10 pm game. We got to the Braves 2 parking lot at 12:10, and were inside by 12:20. We headed right for section 217, and Ozzy took game photo number 78 for me. It took a little coaching, but the last one he took was perfect. Thanks Oz! Since my seats in section 221 are in the sun for almost the entire game, we decided to watch from the concourse for a few innings. After getting Polish sausages from the concession stand (sorry Italian) we headed down to section 111, and watched the game from there. This is the view from the concourse. It’s not a bad spot, besides not being able to see much the scoreboard, but hey; less distractions. The first six batters of the game were retired, and the Brewers came out for the top of the second. 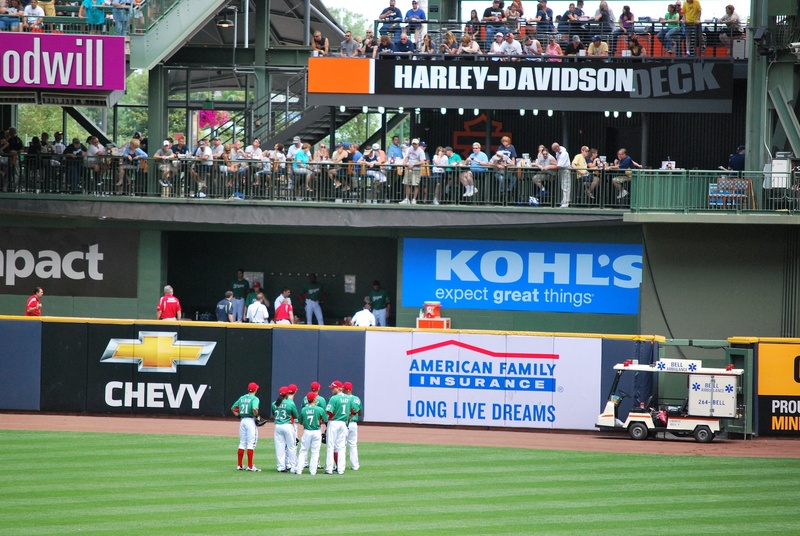 They stopped warming up and I noticed that there was a medical cart by the Brewers’ bullpen. From where we were standing we couldn’t see much but I found out via Twitter that it was a non-uniformed employee they were tending to. Apparently they were performing CPR well before the cart arrived. As you can see, all the Brewers walked out to the outfield, but they probably couldn’t see anything either. I was a little shocked and even more so when the music being played was really upbeat. They were showing the Madagascar clip where the animated characters are dancing to the “I like to move it, move it” song. I know they also have to look out for kids getting bored and stuff, but I thought they shouldn’t have played anything. The Brewers website doesn’t give any details on the condition of the employee but my thoughts and prayers are with him and his family. After the delay the game started up again. Gallardo got the first two batters out in the top of the second but then Aaron Hill singled on a ground ball up the middle. 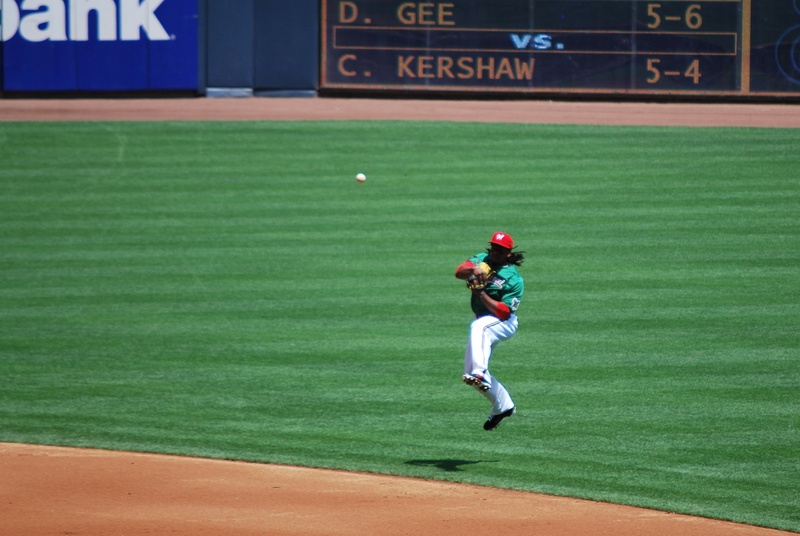 Rickie Weeks made a great play to even make it close, and I got a picture of him just after he let go of the ball. 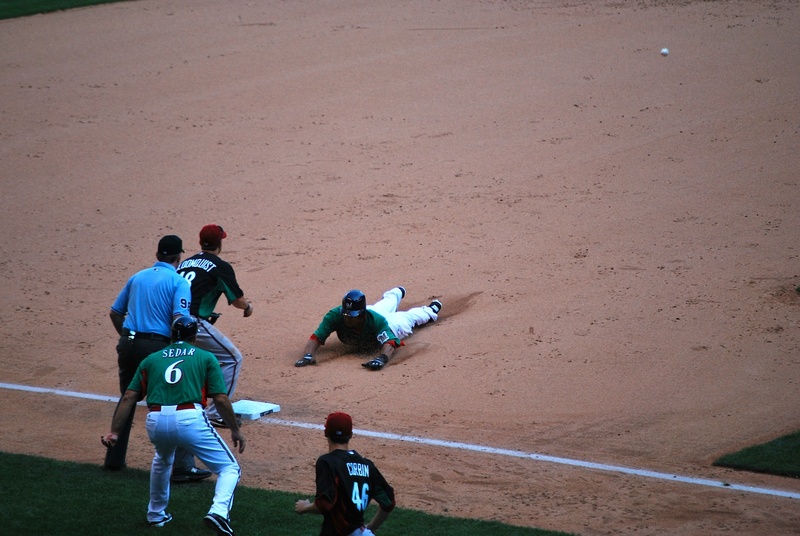 Hill was safe at first by about a half a step. Gallardo then walked Lyle Overbay (former Brewer) to put two on with two out. Gallardo bared down and struck out Gerardo Parra looking on a 95 MPH fastball. 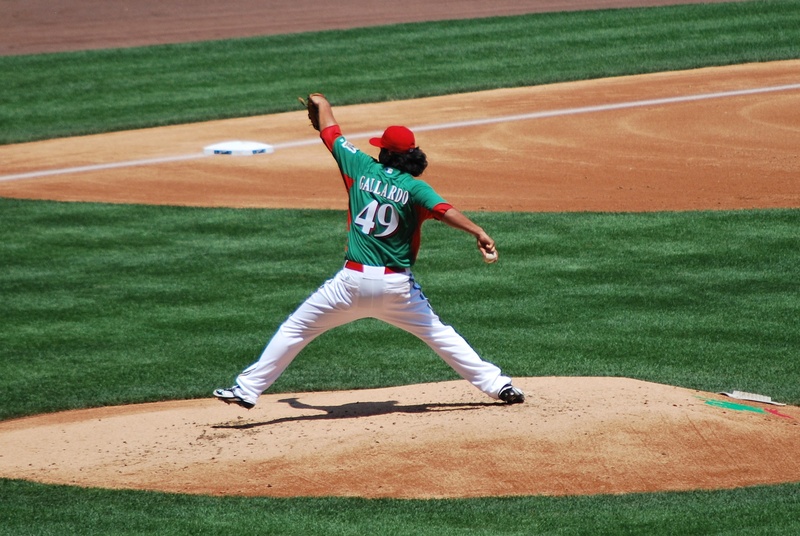 Here’s Gallardo about to release the 2-2 pitch that struck him out. 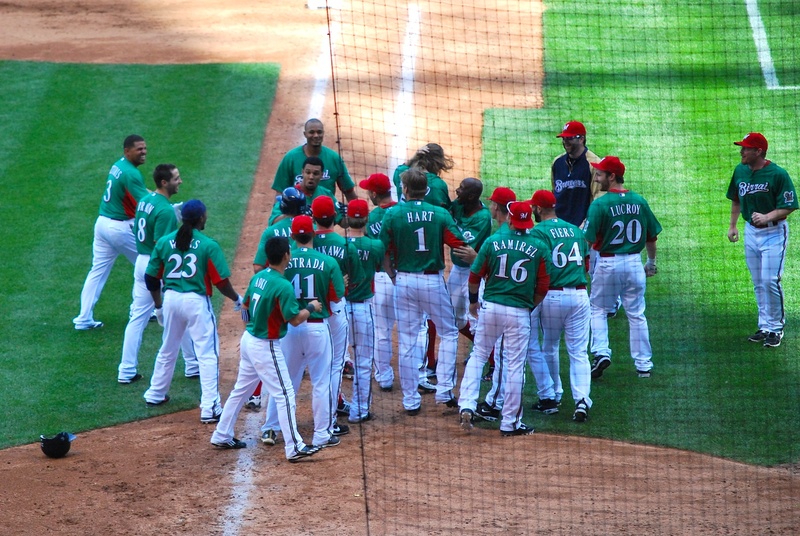 I didn’t mention it before, but the Brewers were wearing green “Birrai” jerseys for Italian Heritage Day as well. 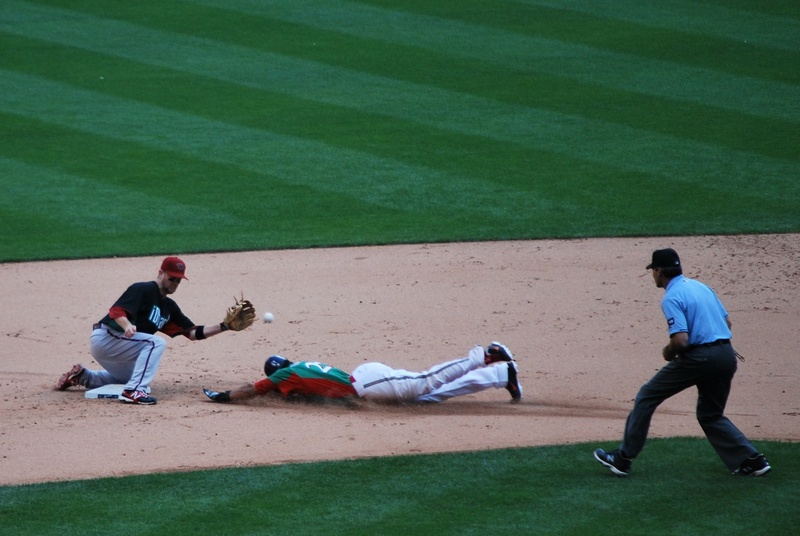 In the top of the fifth the Diamondbacks got a one-out single from Parra, but Gallardo worked around it. 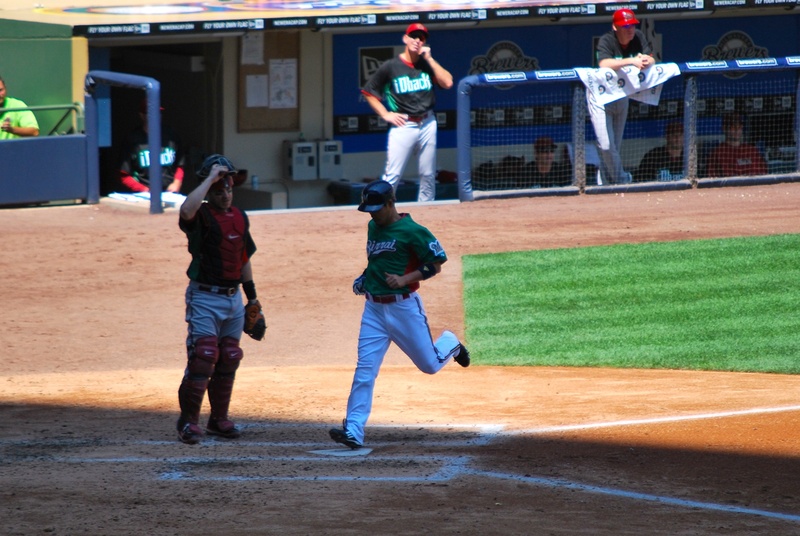 Maldonado threw to first to get the D-Backs pitcher when he (Collmenter) bunted Parra to second. 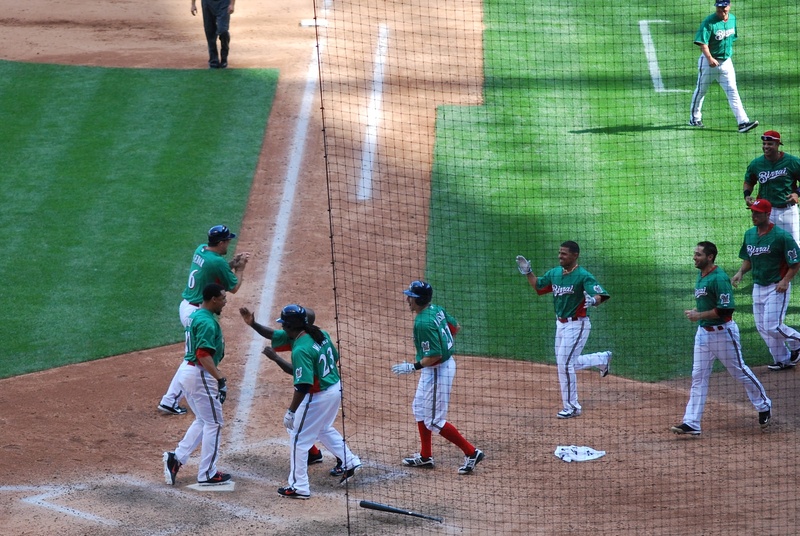 Gallardo then got Bloomquist to ground out to third, and the side was retired. 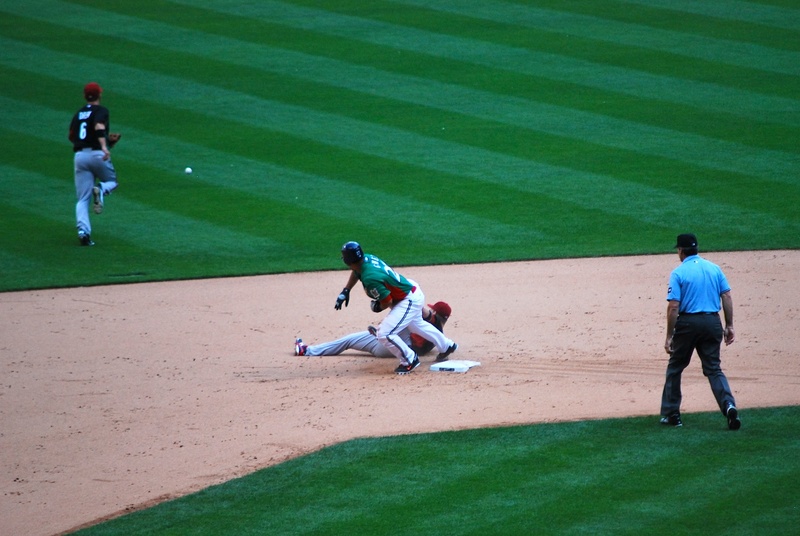 I took a picture just after Aramis Ramirez let go. Good stuff. Between the fifth and sixth innings we headed back upstairs to sit in our seats, and caught the tail end of the sausage race. Since it’s a relay race on Sundays and the kids get the second leg of the race, it was unlikely to be fixed for the Italian sausage. I chose Polish because the kid looked fast. He did me proud and pulled away down the home stretch to get the W. Before the seventh inning I had a nearby fan take a picture of me and Ozzy. I’m on the left, he’s on the right. 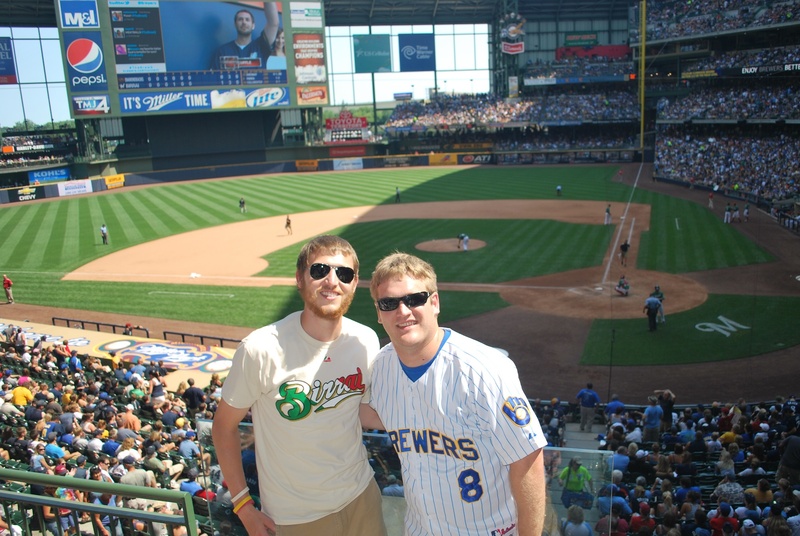 I have to give a shout out to the Brewers, specifically to Nathan, who works in the merchandising department. He notified me on Friday that I had a Birrai shirt waiting for me in the team store (I picked it up on Saturday). 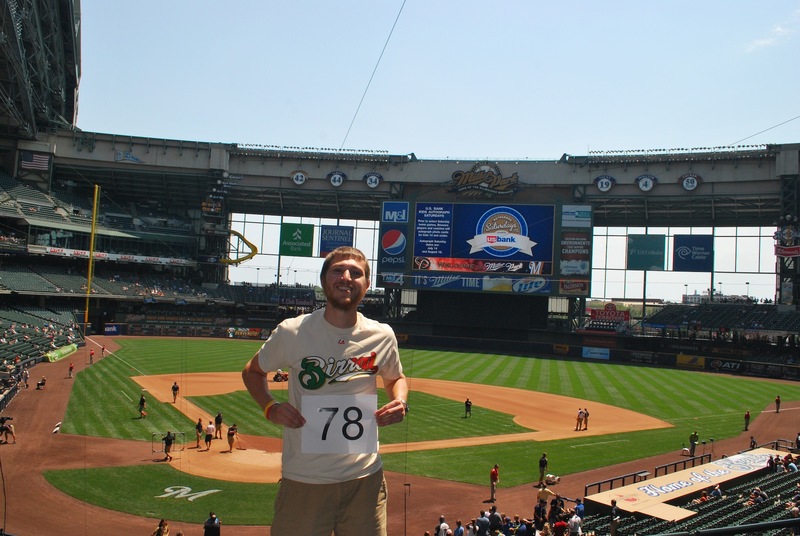 I’ll mention Kathy Schwab as well, who helped get the Brewers on board to support my mission, and it led to me getting free tickets and merchandise. 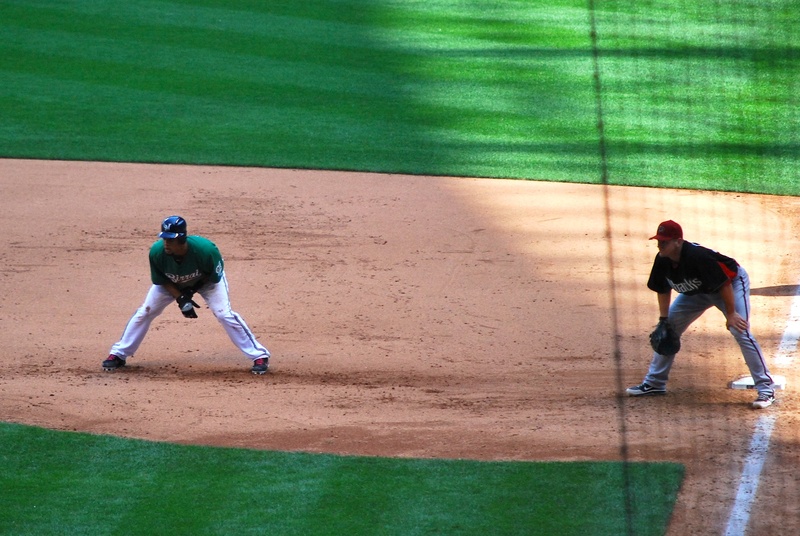 Gerardo Parra (playing centerfield) scooped up the ball and tried to throw out Gomez at third. This is Gomez utilizing another headfirst slide. You can see the ball in the upper left, and it’s obvious that Parra should’ve just held the ball because there was no chance he was going to get the speedy Gomez. The ball wound up ricocheting off Gomez (maybe his helmet?) and it bounced up and over the Diamondbacks dugout. If a ball is thrown out of play, every base runner get to advance one base, meaning that Gomez could walk home. 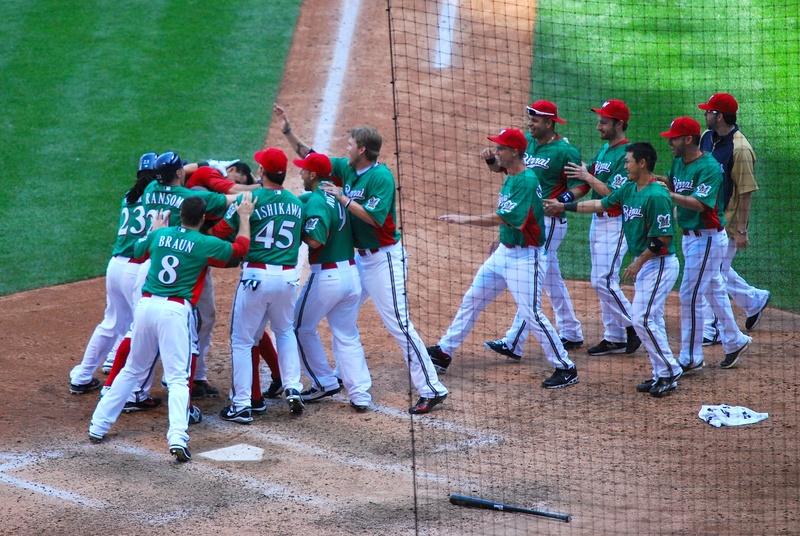 As he neared home plate his teammates were waiting for him. 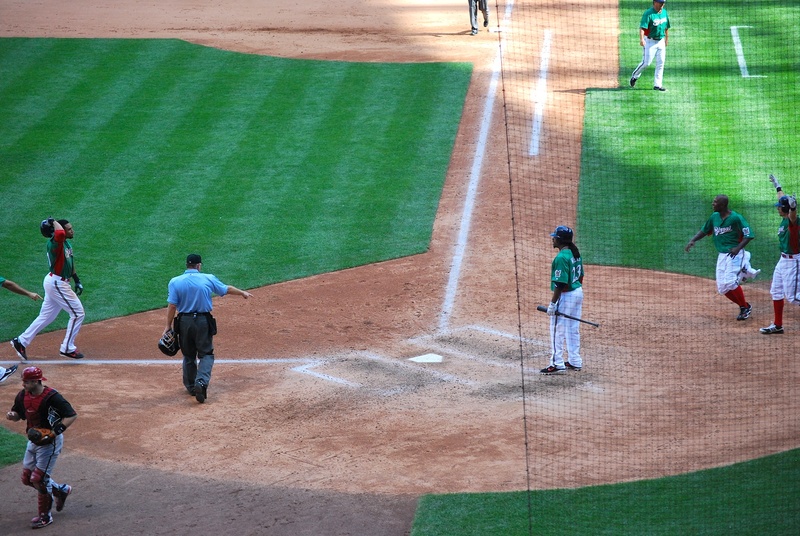 I like that the umpire is pointing at home plate like Gomez doesn’t know where it is. 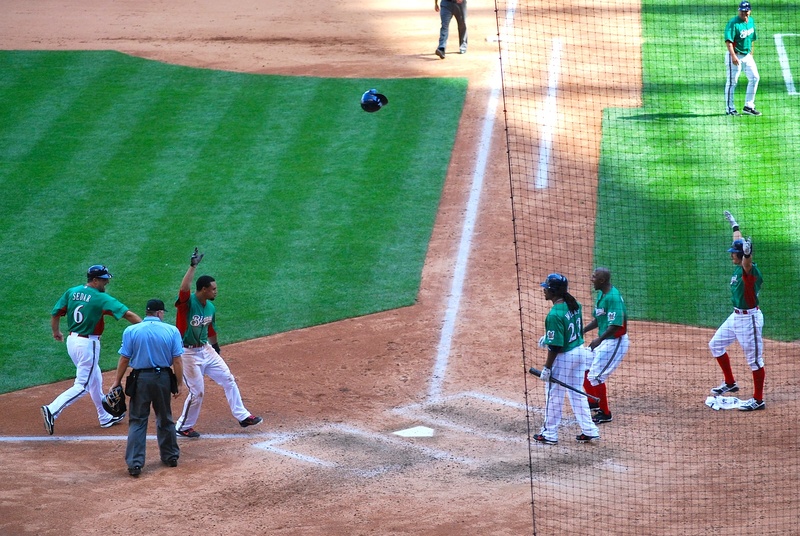 This is Gomez just after he ceremoniously threw his helmet into the air. I like Nyjer screaming there on the right. 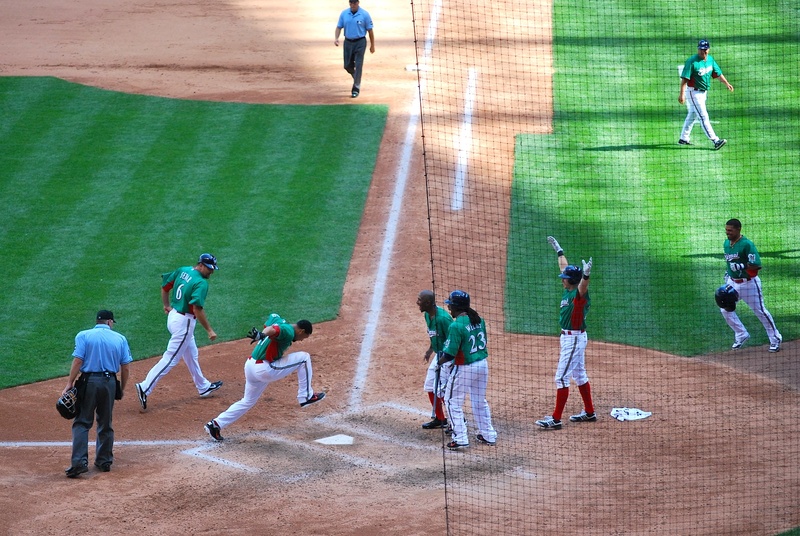 Gomez gave an emphatic foot stomp for the deciding run in the walk-off win. After touching home you could tell that some shenanigans were about to ensue. I like that Rickie finally let go of his bat, and the picture was taken as it was just inches above the dirt, like it’s just floating there. They finally decided that he had gotten enough body shots and noogies, and they called it quits. Two things I like about this one. The first is Gomez’s facial expression. He’s looking at Ransom whose hand was on Gomez’s head in the previous picture (above). I also like Randy Wolf just chilling on the right there. I don’t think he wanted any part of the fiasco, and he just waited on the periphery for it to die down a bit before getting a high five from Gomez. It was a great ending and it shows why Corbin was trying to prevent Gomez from stealing second base. It did take two errors for him to score, but it was his speed that influenced the quick throws and bad decisions. Final Score: Brewers 2 – Diamondbacks 1. I know I usually just do four part pictures for things like walk-offs, but I thought I’d give you a more detailed account of what went down. If for some reason you don’t like pictures; I apologize, you can leave me a nasty comment if you want. I’m just glad they turned out. I was frantically snapping pictures as the above events occurred, and I’m pretty happy with the results. I’ve got about 18 hours before I have to leave for the game. 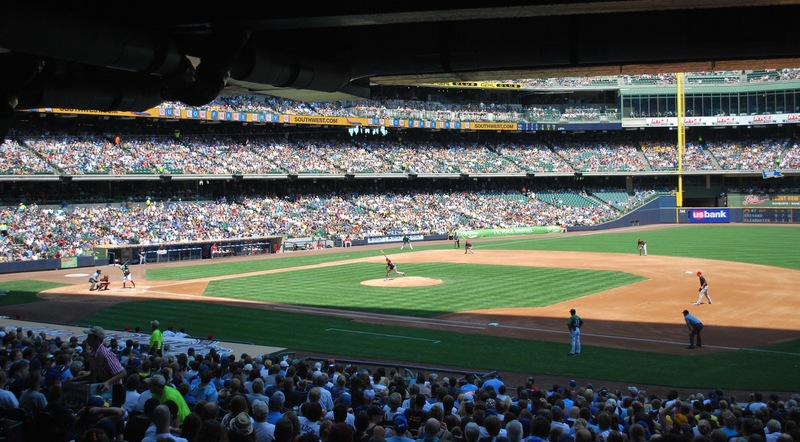 I’m looking forward to the 3/4 of a day break but I’m also looking forward to heading back to Milwaukee to see game one of the Brewers-Marlins series. The pictures are great. You take much better pictures than I do. You have a very nice Camera, but still you take great pictures.